Are atherosclerosis and peripheral vascular disease related? What are the signs and symptoms of peripheral artery disease (PVD)? Who is at risk for peripheral artery disease (PVD)? How does atherosclerosis cause disease? What are the other causes of peripheral vascular diseases (PVD)? Is there a test to diagnose peripheral artery disease (PVD)? What are the management and treatment guidelines for peripheral vascular disease (PVD)? Which specialties of doctors treat peripheral vascular disease (PVD)? What are potential complications of peripheral artery disease (PVD)? How can I prevent from getting peripheral vascular disease (PVD)? The term peripheral vascular disease is commonly used to refer to peripheral artery disease or peripheral arterial disease (PAD), meaning narrowing or occlusion by atherosclerotic plaques of arteries outside of the heart and brain. Peripheral artery disease is a form of arterial insufficiency, meaning that blood circulation through the arteries (blood vessels that carry blood away from the heart) is decreased. Risk factors for peripheral arterial disease include high blood cholesterol, diabetes, smoking, hypertension, inactivity, and overweight/obesity. A small percentage of people over the age of 50 are believed to suffer from peripheral artery disease. The symptoms of peripheral artery disease depend upon the location and extent of the blocked arteries. The most common symptom of peripheral artery disease is intermittent claudication, manifested by pain (usually in the calf) that occurs while walking and dissipates at rest. Doctors may use radiologic imaging techniques including Doppler ultrasound and angiography to aid in the diagnosis of peripheral artery disease. Peripheral arterial disease can be treated by lifestyle alterations, medications, angioplasty and related treatments, or surgery. A combination of treatment methods may be used. Complications of peripheral artery disease include sores that do not heal, ulcers, gangrene, or infections in the extremities. In rare cases, amputation may be necessary. Having peripheral artery disease usually indicates the potential for arterial disease involving the coronary arteries within the brain. Peripheral vascular disease (PVD) refers to diseases of the blood vessels (arteries and veins) located outside the heart and brain. While there are many causes of peripheral vascular disease, doctors commonly use the term peripheral vascular disease to refer to peripheral artery disease (peripheral arterial disease, PAD), a condition that develops when the arteries that supply oxygen-rich blood to the internal organs, arms, and legs become completely or partially blocked as a result of atherosclerosis. Atherosclerosis is a gradual process whereby hard cholesterol substances (plaques) are deposited in the walls of the arteries. This buildup of cholesterol plaques causes hardening of the artery walls and narrowing of the inner channel (lumen) of the artery. When this happens in the peripheral circulation, peripheral vascular disease is the result. The atherosclerosis process begins early in life (as early as teens in some people). When atherosclerosis is mild and the arteries are not substantially narrowed, atherosclerosis causes no symptoms. Therefore, many adults typically are unaware that their arteries are gradually accumulating cholesterol plaques. However, when atherosclerosis becomes advanced with aging, it can cause critical occlusive disease of the arteries resulting in tissue ischemia (lack of blood and oxygen). Arteries that are narrowed by advanced atherosclerosis can cause diseases in different organs. 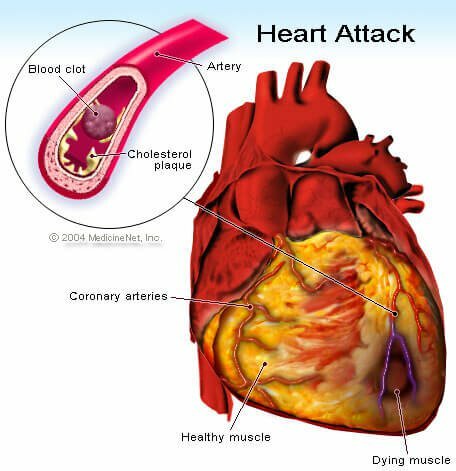 For example, advanced atherosclerosis of the coronary arteries (arteries that supply heart muscles) can lead to angina, coronary heart disease, and heart attacks. 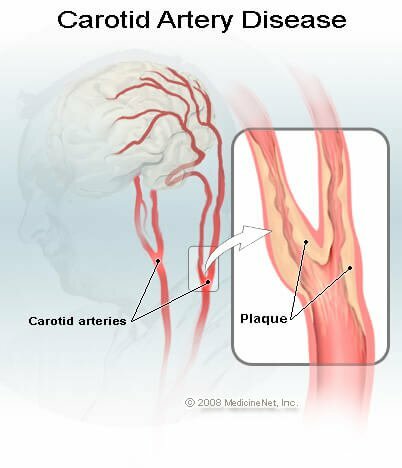 Advanced atherosclerosis of the carotid and cerebral arteries (arteries that supply blood to the brain) can lead to strokes and transient ischemic attacks (TIA). Advanced atherosclerosis in the lower extremities can lead to pain while walking or exercising (claudication), deficient wound healing, and/or leg ulcers. Atherosclerosis is often generalized, meaning it affects arteries throughout the body. Therefore, patients with heart attacks are also more likely to develop strokes and peripheral vascular disease, and vice versa. Approximately half of people with peripheral artery disease do not experience any symptoms. For patients with symptoms, the most common symptoms are intermittent claudication and rest pain. Intermittent claudication refers to arm or leg pain or cramping in the arms or legs that occurs with exercise and goes away with rest. The severity and location of the pain of intermittent claudication vary depending upon the location and extent of blockage of the involved artery. The most common location of intermittent claudication is the calf muscle of the leg, leading to calf or leg pain while walking. The pain in the calf muscle occurs only during exercise such as walking, and the pain steadily increases with continued walking until the patient has to stop due to intolerable pain. Then the pain quickly subsides during rest. Intermittent claudication can affect one or both legs. Rest pain in the legs occurs when the artery occlusion is so critical that there is not enough blood and oxygen supply to the legs even at rest and represents a more serious form of the condition. The pain typically affects the feet, is usually severe, and occurs at night when the patient is lying down, face up. In peripheral artery disease, the risk factors are additive, so that a person with a combination of two risk factors -- diabetes and smoking, for example -- has an increased likelihood of developing more severe peripheral artery disease than a person with only one risk factor. Atherosclerosis causes disease in two ways. 1) Atherosclerosis can limit the ability of the narrowed arteries to increase delivery of blood and oxygen to the to tissues of the body during times when oxygen demand needs to be increased, for example, during exertion; or 2) complete obstruction of an artery by a thrombus or embolus (thrombus and embolus are forms of blood clots), which results in tissue death (necrosis). Exertional angina and intermittent claudication are two examples of insufficient delivery of blood and oxygen to meet tissue demand; whereas strokes and heart attacks are examples of death of tissue caused by complete artery obstruction by blood clots. There are many similarities between coronary heart diseases (or coronary artery disease, which is atherosclerosis involving the arteries of the heart) and peripheral artery disease, and the two conditions may coexist in the same individual. For example, patients with exertional angina typically have no symptoms at rest. However, during exertion the critically narrowed coronary arteries are incapable of increasing blood and oxygen delivery to meet the increased oxygen needs of the heart muscles. Lack of blood and oxygen causes chest pain (exertional angina). Exertional angina typically subsides when the patient rests. In patients with intermittent claudication, the narrowed arteries in the lower extremities (for example, a narrowed artery at the groin) cannot increase blood and oxygen delivery to the calf muscles during walking. These patients experience pain in the calf muscles that will only subside after resting. Patients with unstable angina have critically narrowed coronary arteries that cannot deliver enough blood and oxygen to the heart muscle even at rest. These patients have chest pain at rest and are at imminent risk of developing heart attacks. Patients with severe artery occlusion in the legs can develop rest pain (usually in the feet). Rest pain represents such severe occlusion that there is insufficient blood supply to the feet even at rest. They are at risk of developing foot ulcers and gangrene. When atherosclerosis narrows the arteries, blood tends to clot in the narrowed areas, forming a thrombus, a type of blood clot (plural thrombi). Sometimes pieces of the blood clot break off and travel in the bloodstream until they are trapped in a narrower point in the artery beyond in which they cannot pass. A thrombus or piece of thrombus that travels to another point is called an embolus. Thrombi and emboli can cause sudden and complete artery blockage, leading to tissue necrosis (death of tissue due to lack of oxygen). For example, complete blockage of a coronary artery by a thrombus causes heart attack, while complete blockage of a carotid or cerebral artery causes ischemic stroke. Emboli originating from atherosclerosis in the aorta (the main artery delivering blood to the body) can obstruct small arteries in the feet, resulting in painful and blue (cyanotic) toes, foot ulcers, and even gangrene. What are collateral vessels or collateral circulation? Sometimes, despite the presence of a severe blockage in an artery, the involved area does not become painful or lose its blood supply due to the presence of collateral vessels. Collateral circulation means that the particular area is supplied by more than one artery, so that that blockage of a single vessel does not result in a severe degree of blood loss. Collateral circulation can develop over time to help provide oxygenated blood to an area where an artery is narrowed. Doctors believe that regular supervised exercise can stimulate the growth and development of collateral circulation and relieve symptoms of intermittent claudication. A number of conditions such as vasculitis may cause damage to blood vessels throughout the body. Injuries to blood vessels (from accidents such as auto accidents or sports injuries), blood-clotting disorders, and damage to blood vessels during surgery can also lead to inadequate blood supply to body tissues (ischemia). Tissue ischemia can also occur in the absence of atherosclerosis or other abnormalities of arteries. One example of a condition in which the blood vessels themselves are not damaged is Raynaud's disease, which is believed to occur due to spasms in blood vessels brought on by stress or a cold environment. Since atherosclerosis of the peripheral arteries (PAD) is by far the most common cause of peripheral vascular disease, the rest of this article focuses upon peripheral artery disease. Doppler ultrasound - This form of ultrasound (measurement of high-frequency sound waves that are reflected off of tissues) that can detect and measure blood flow. Doppler ultrasound is used to measure blood pressures behind the knees and at the ankles. In patients with significant peripheral artery disease in the legs, the blood pressures in the ankles will be lower than the blood pressure in the arms (brachial blood pressure). The ankle-brachial index (ABI) is a number derived from dividing the ankle blood pressure by the brachial blood pressure. An ankle-brachial index of 0.9 to 1.3 is normal, an ABI less than 0.9 indicate the presence of peripheral artery disease in the arteries in the legs, and an ABI below 0.5 usually indicates severe arterial occlusion in the legs. Duplex ultrasound - This is a color assisted non-invasive technique to study the arteries. Ultrasound probes can be placed on the skin overlying the arteries and can accurately detect the site of artery stenosis as well as measure the degree of obstruction. Angiography - An angiography is an imaging procedure to study the blood vessels of the extremities, similar to the way a coronary angiogram provides an image of the blood vessels supplying the heart. It is the most accurate test to detect the location(s) and severity of artery occlusion, as well as collateral circulations. Small hollow plastic tubes (catheters) are advanced from a small skin puncture at the groin (or the arm), under X-ray guidance, to the aorta and the arteries. Iodine contrast "dye," is then injected into the arteries while an X-ray video is recorded. Angiogram gives the doctor a picture of the location and severity of narrowed artery segments. This information is important in helping the doctor select patients for angioplasty or surgical bypass (see below). Because X-ray angiography is invasive with potential side effects (such as injury to blood vessels and contrast dye reactions), it is not used for initial diagnosis of peripheral artery disease. It is only used when a patient with severe peripheral artery disease symptoms is considered for angioplasty or surgery. A number of different imaging methods have been used in angiography examinations, including X-rays, magnetic resonance imaging (MRI), and computed tomography (CT) scans. Magnetic resonance imaging (MRI) angiography uses magnetism, radio waves, and a computer to produce images of body structures and has the advantage of avoiding X-ray radiation exposure. Relieve the pain of intermittent claudication. Improve exercise tolerance by increasing the walking distance before the onset of claudication. Prevent critical artery occlusion that can lead to foot ulcers, gangrene, and amputation. Prevent heart attacks and strokes. Treatment of peripheral artery disease includes lifestyle measures, supervised exercises, medications, angioplasty, and surgery. Smoking cessation eliminates a major risk factor for disease progression, and it lowers the incidences of pain at rest and amputations. Smoking cessation also is important to prevent heart attacks and strokes. A healthy diet can help lower blood cholesterol and other lipid levels and may help control blood pressure. Keep other risk factors, such as diabetes, lipid levels, and blood pressure under control by following medical advice regarding medications and lifestyle changes. Proper exercise can condition the muscles to use oxygen effectively and can speed the development of collateral circulation. Clinical trials have shown that regular supervised exercise can reduce symptoms of intermittent claudication and allow individuals to walk longer before the onset of claudication. Ideally, your health care provider should prescribe an exercise program tailored to your specific needs. Rehabilitation programs supervised by healthcare professionals such as nurses or physical therapists may help. Exercise at least three times a week, each session lasting longer than 30 to 45 minutes for the best results. Exercise usually involves walking on a monitored treadmill until claudication develops; walking time is then gradually increased with each session. Patients are also monitored for the development of chest pain or heart rhythm irregularities during exercise. While lifestyle changes may be enough treatment for some people with peripheral artery disease, others may require medication. Examples of medications used to treat peripheral artery disease include antiplatelet or anticlotting agents, cholesterol-lowering drugs such as statins, medications that increase blood supply to the extremities such as cilostazol (Pletal) and pentoxifylline (Trental), and medications that control high blood pressure. Antiplatelet medications (such as aspirin and clopidogrel [Plavix]) make the blood platelets less likely to stick to one another to form blood clots. Low-dose aspirin (81 to 325 mg/day) is usually prescribed indefinitely because it is also helpful in preventing strokes and heart attacks in patients with peripheral artery disease. Clopidogrel (Plavix) is an alternative to aspirin for those who are allergic or cannot tolerate aspirin. Antiplatelet medications also help prevent occlusion of blood vessels after angioplasty or bypass surgery. Anticoagulant medications act to prevent blood clotting. Both heparin and warfarin (Coumadin, Jantoven) are anticoagulant medications. Anticoagulants are sometimes prescribed for people with peripheral artery disease if they are at increased risk for formation of blood clots; these agents are used much less frequently than anti platelet agents in patients with peripheral artery disease. Cholesterol-lowering drugs of the statin class have been shown in numerous large clinical trials to help prevent heart attacks and strokes and prolong survival among patients with atherosclerosis. Statins have also been shown to slow the progression of peripheral artery disease, decrease arthrosclerosis in the arteries, and improve claudication symptoms. Cilostazol (Pletal) is a medication that can help increase physical activity (enabling one to walk a greater distance without the pain of claudication). Cilostazol works by causing dilation of the arteries and an increased supply of oxygenated blood to be delivered to the arms and legs. Cilostazol is recommended for some patients with claudication when lifestyle modifications and exercise are ineffective. Side effects are generally mild and include headache, diarrhea, and dizziness. Cilostazol should not be used in patients with heart failure because of concern over increased mortality in heart failure patients using medications similar to cilostazol. Pentoxifylline (Pentoxyl, Trental) improves blood flow to the extremities by decreasing the viscosity ("stickiness") of blood, enabling more efficient blood flow. Side effects are fewer than with cilostazol, but its benefits are weaker and have not been conclusively proven by all studies. Drugs to control hypertension may also be prescribed. Current recommendations are to treat hypertension in patients with peripheral artery disease to prevent strokes and heart attacks. Angioplasty, also known as percutaneous transluminal angioplasty, or PTA, is a nonsurgical procedure that can widen a narrowed or blocked artery. A thin tube (catheter) is inserted into an artery in the groin or arm and advanced to the area of narrowing. A tiny balloon on the tip of the catheter is then inflated to enlarge the narrowing in the artery. This procedure is also commonly performed to dilate narrowed areas in the coronary arteries that supply blood to the heart muscle. Sometimes the catheter technique is used to insert a stent (a cylindrical wire mesh tube) into the affected area of the artery to keep the artery open. In other cases, thrombolytic medications (medications that dissolve blood clots) may be delivered to the blocked area via a catheter. Angioplasty does not require general anesthesia. Usually, a local anesthetic at the area of catheter insertion and a mild sedative are given. Major complications of angioplasty are rare, but can occur. These include damage to the artery or blood clot formation, excessive bleeding from the catheter insertion site, and abrupt vessel closure (blockage of the treated area occurring within 24 hours of the procedure). Despite these risks, the overall incidence of complications is low and the benefits of angioplasty (no general anesthesia, no surgical incision, and the ability to return to normal activities within a couple of days) outweigh its risks. Usually a one-night hospital stay is required when angioplasty is performed. Angioplasty is used when a patient has claudication that limits his or her activities and does not respond to exercise, medications, and lifestyle measures. Most doctors also recommend angioplasty when disease is very severe, and there is a focal, localized narrowing that is accessible via catheter. If a patient is too ill to have surgery and has severe ischemia (decreased oxygen in the tissues) that threatens loss of a limb, angioplasty may also be attempted. Some cases of peripheral artery disease may be more difficult to treat by angioplasty. For example, blockages in multiple small arteries of the legs or blockages in extremely small vessels may not be treatable by this method. Surgical treatment for peripheral artery disease involves either bypass vascular surgery performed by a vascular surgeon or endarterectomy. Indications for surgical treatment of peripheral artery disease include lesions that, for anatomical reasons, may be difficult to treat by angioplasty. Examples include lesions covering long segments of a vessel, vessels with multiple narrowed areas, or long areas of narrowing. Bypass surgery involves using a vein from your body or a portion of synthetic vessel (known as grafts) to create a detour around the blockage. One end of the graft is sewn to the damaged artery above the blockage and the other end is sewn below the blocked area. Blood flow is then able to bypass the area of narrowing or blockage Bypass surgery is a major surgical procedure requiring general anesthesia and a hospital stay. Endarterectomy is a procedure in which the surgeon cleans out plaque buildup inside the artery of the affected leg or arm. A number of different specialists may treat individuals with peripheral artery disease, for example, internists, family practitioners, or cardiologists may mange medication treatment. Interventional cardiologists or radiologists may perform angioplasty. Vascular surgeons may perform some surgical procedures to treat peripheral artery disease. In rare cases, the decreased circulation to the extremities characteristic of peripheral artery disease can lead to open, non-healing sores, ulcers, gangrene, or other limb-threatening injuries to the extremities. The areas that do not receive adequate blood flow are also more prone to develop infections and, in extreme cases, amputation may be necessary. Peripheral vascular disease related to atherosclerosis can be prevented by minimizing the risk factors that are controllable, such as eating a heart-healthy diet, maintaining a healthy weight, not smoking, getting regular exercise, and maintaining good control of blood sugar levels if you have diabetes. Stephens, E. "Peripheral Vascular Disease." Medscape. Dec. 31, 2017. <http://emedicine.medscape.com/article/761556-overview>.